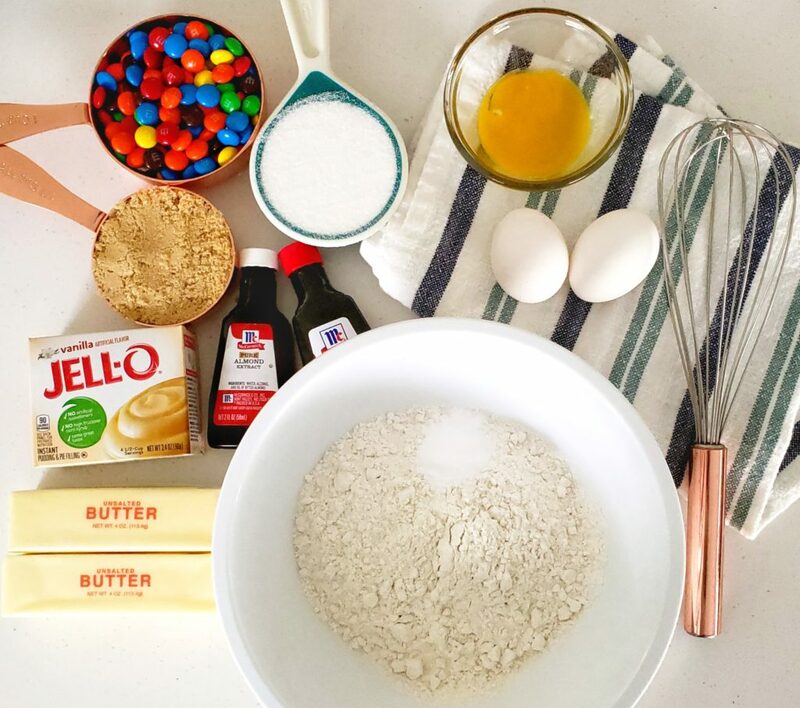 There’s just something about M&Ms that makes life a little happier…and a lot more colorful! Add them to a cookie, and it doesn’t get much better than that. Another great thing about M&Ms is that you can customize them for any holiday or special occasion. All you need is the right colors! 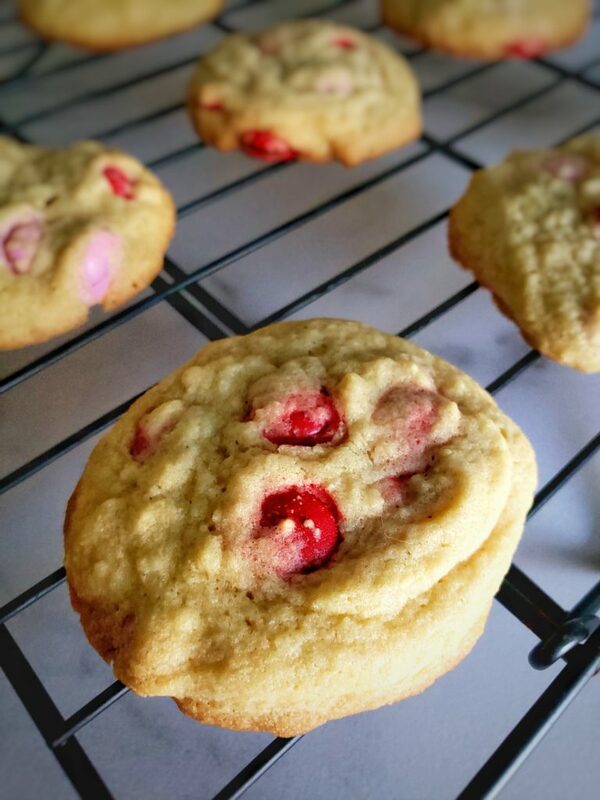 Have you ever added instant pudding mix to a cookie recipe? If not, you are seriously missing out. That’s the secret to a seriously soft cookie. That, and not overbaking them, of course! I know that Jello brand of instant vanilla pudding mix doesn’t contain any gluten, but I’m not sure about other brands. So be sure to check the label. 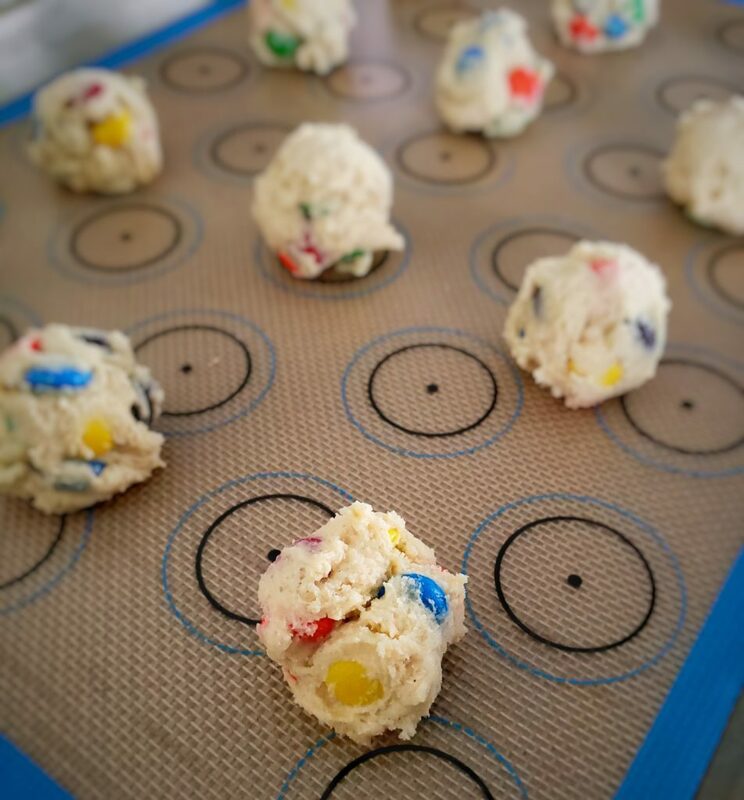 The only “annoying” thing about M&M cookies is that the chocolate candies can bleed a little into the dough. 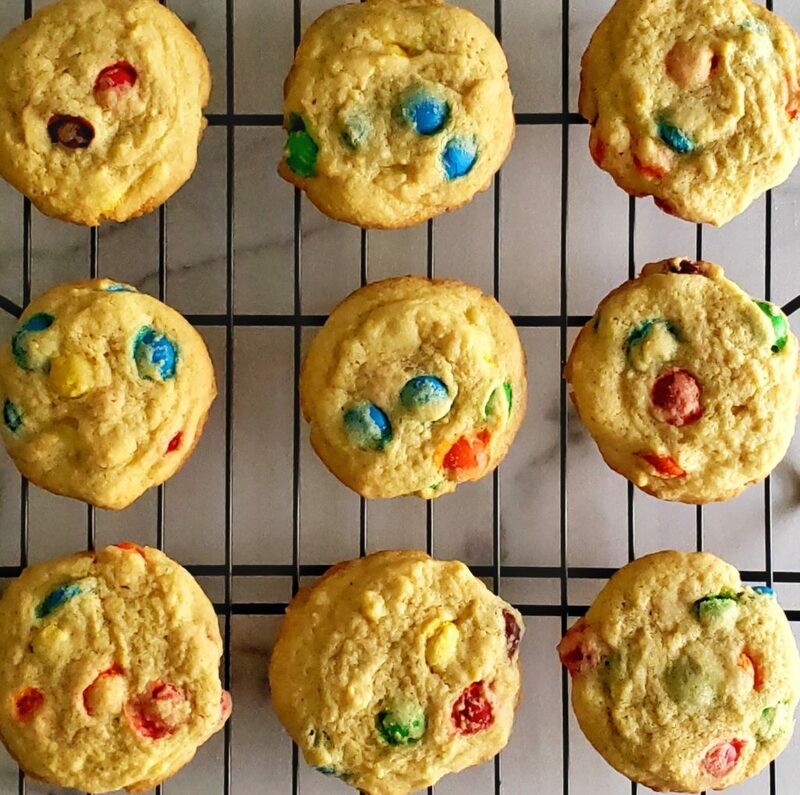 I actually don’t mind this, but if you do, don’t add any M&Ms until the cookies finish baking. Then press them gently on top after taking the cookies out of the oven. This recipe yields 40 cookies. If you only have a couple of baking sheets then you’ll need to reuse them. But don’t put cookie dough on a warm pan. Wait until the pan is at room temperature. To speed up the pan-cooling process, you can pop it into the refrigerator for a few minutes. 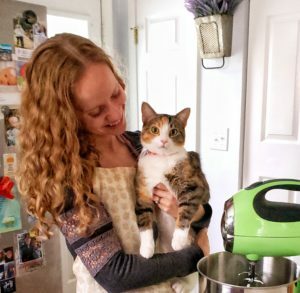 I love how holiday-friendly this recipe is, and I think you will, too! I most recently made these for Valentine’s Day. 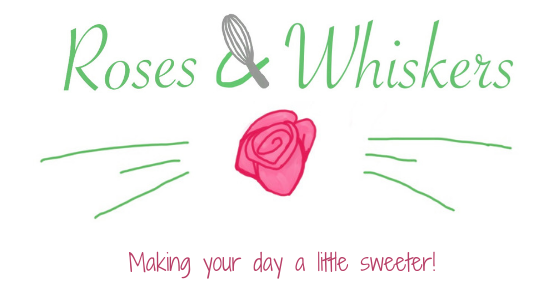 Tag me @rosesandwhiskers on Instagram if you try it and use the hashtag #rosesandwhiskers. Happy baking! Chewy, soft and sweet, these classic cookies can be customized for any holiday or special event. All you need is the right color of M&Ms! Whisk together the flour and baking soda in a medium bowl. In a large bowl cream the butter and sugars until light and fluffy. Cream in the pudding mix. Beat in the eggs and yolk, one at a time, until fully incorporated. Mix in the extracts. On low speed, gradually stir in the flour mixture until just combined. Fold in the M&Ms. 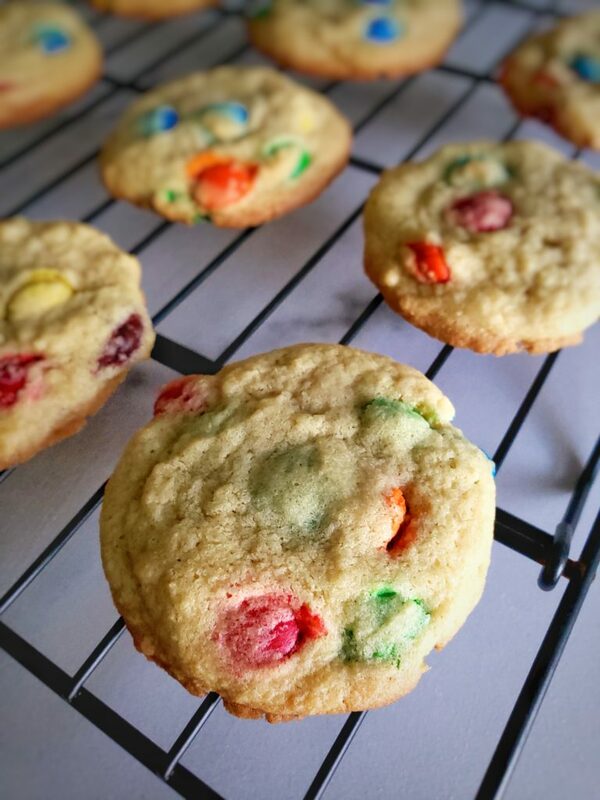 You can also press extra M&Ms on top of the cookies once they come out of the oven. Drop spoonfuls of batter that are about 1.5 inches in diameter on the prepared pans, spacing them a few inches apart (12 cookies per pan). Bake for 8 to 12 minutes, or until the edges are lightly browned. You want the middle to be a little soft but you don't want it to look raw. Let them rest on the pan for 5-10 minutes so that the middles firm up a bit and then transfer them to a wire cooling rack.